Some time between 1990 and now, what started out as something about people being able to bring their own personal skills and interests to the job did a 180, and became about going above and beyond for the organization. “Employee engagement” is what the boss says the organization needs more of, and what his or her manager sometimes says was lacking in response to questions about “why didn’t the initiative take hold?’ Organizations base major initiatives on it and pay millions for consultants to help measure it and assume gains based on it. But you’ll fi­nd it interesting to note that how we think of “employee engagement” today is a 180 from what it was initially coined to embody some 25 years ago. What’s more, even how it’s de­nied is up for debate. 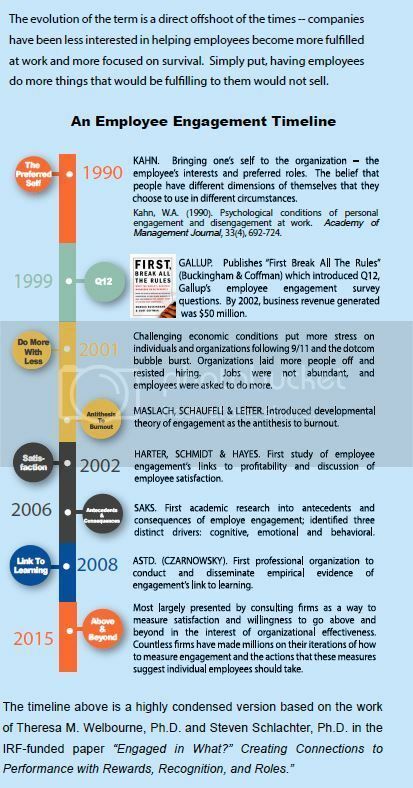 The original concept of employee engagement is credited to Kahn in1990 as part of his research into identify theory. Kahn observed two organizations – one a highly structured and formal architectural ­firm, the other a loose and casual summer camp. At the camp, Kahn observed a scuba instructor who spoke passionately about diving from his personal experiences. Drawing on these observations, Kahn concluded that the freedom to “bring oneself” into the work makes people more engaged with the work process. In short, engagement as originally de­nied was all about bringing one’s personal skills and interests to the job. Alot has transpired since then. Today, engagement is less focused on the individual bringing his/her own interests and preferred roles to work, and more about “going above and beyond” to the benefi­t of the organization. There is extensive disagreement about what employee engagement is. Kahn’s de­finition (1990) was “the harnessing of organizational members’ selves to their work roles -- where people employ and express themselves physically, cognitively and emotionally during role performances. 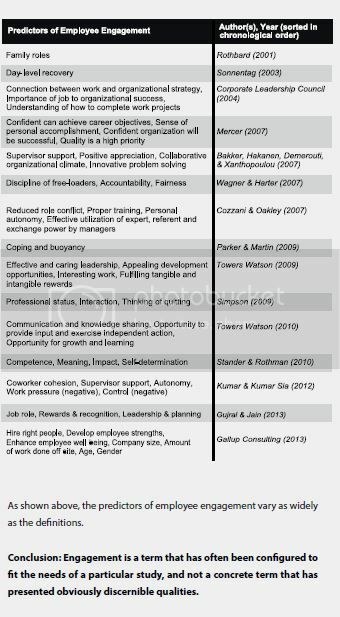 Towers Watson (2010) refers to it as the extent to which employees share their company’s values, feel pride in working for their company, are committed to working for their company and have favorable perceptions of their work environment. In between, de­finitions employ words like “emotionally invested,” “persistence directed toward the organization’s goals,” and more. Given the disparities in defi­nitions of what engagement is, what do we know about what engagement is not? The topic of burnout (Schaufeli & Baker) establishes engagement as a positive dimension of well-being, with burnout being negative. Burnout involves low levels of energy and is a psychological syndrome that leads to feelings of cynicism, detachment, and exhaustion -- seen as the erosion of engagement. In short, when one feels “energized” at work, that person is more inclined to exert effort. New terms have arisen from the entry of energy into the equation: Sustainable Engagement -- (Towers Watson, 2012) -- to describe the intensity of employees’ connection to their organization. The basis being three core elements: being engaged, being enabled and feeling energized. Employee Work Passion -- (Zigarmi, 2009) -- a persistent, emotionally positive ... resulting in consistent constructive work intentions and behaviors. As shown above, the predictors of employee engagement vary as widelyas the denitions. Conclusion: Engagement is a term that has often been congured tot the needs of a particular study, and not a concrete term that haspresented obviously discernible qualities. Although researchers do not agree on what employee engagement is or what its predictors are, there’s no lack of measurement systems in the marketplace. Utrecht Work Engagement Scale (Schaufeli & Bakker, 2003). With a seventeen-item scale, this model is divided into categories that include vigor, dedication and absorption. • Vigor -- high levels of persistence, energy, and mental resilience while working, and the willingness to invest effort in one’s work. • Dedication -- being strongly involved in one’s work, and experiencing a sense of significance, enthusiasm, inspiration, pride, and challenge. • Absorption -- being fully concentrated and deeply engrossed in one’s work, whereby time passes quickly and one has difficulties with detaching oneself from work. Numerous vendor created (and proprietary) measurement scales are also used -- some of which include scales from Blessing White, Gallup, Hewitt, Sirota, Towers Watson, Valtera, and Watson Wyatt Worldwide. The Gallup Workplace Audit (also known as the GWA or Q12) is used extensively and has evolved from a measure of workplace attitudes. The first version of the GWA appeared in the 1990’s to judge workplace attitudes. 2009 marked its seventh interation. All of this work is being done to effect improvements in organizational effectiveness. Outcomes cited range are widely varying and include improvements in customer satisfaction, reduced burnout/turnover, improvements in safety, overall job performance improvements, and many more.